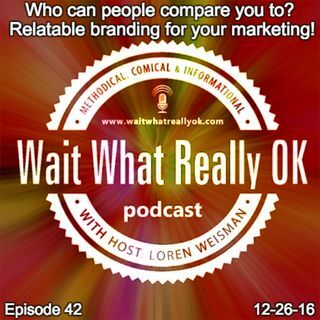 Wait What Really OK Podcast Episode 42 hosted by Brand Precision Marketing Strategist and Counselor, Loren Weisman discusses the concept of relatable branding and how it can supplement your marketing by making better initial and vicarious connections. It might almost sound like a joke but who can you be compared to both inside and outside of your business? Think about a wider approach to connect people to ... Más informaciones what you do, who you are as well as what and who they remind you of. Too many people get caught up in the idea of not wanting to be compared to anyone else, while it can actually open a door and start a connection whether serious, humorous or just familiar. Podcast Blog Supplement for Episode 42 of the Wait What Really OK Podcast with Loren Weisman. Podcast Link Supplement for Episode 42 of the Wait What Really OK Podcast with Loren Weisman. Podcast Video Supplement for Episode 42 of the Wait What Really OK Podcast with Loren Weisman. Podcast Photo Supplement for Episode 42 of the Wait What Really OK Podcast with Loren Weisman.